This is a very practical device with advanced technology. It is useful, easy to use and also has voice technology. It distinguishes between 1,000 shades of colour as well as patterns and contrasts that convert to musical tones so that the blind person may associate colours better. This device helps to improve personal autonomy. It is extremely helpful for those who have lost their sight and would like to be aware of the colours of their clothing or any other type of object. The musical tones it produces can help anyone who wants to recognise colour patterns on a surface although this feature can be too specific for the elderly or those who simply want to recognise a smell. 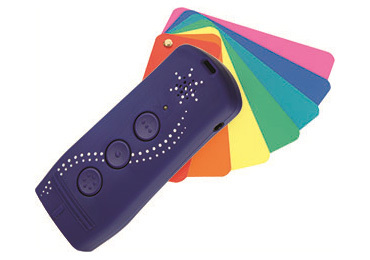 This is a creative device with a rather precise level of colour recognition although factors like lighting and the device’s position should be taken into account when gauging colour.